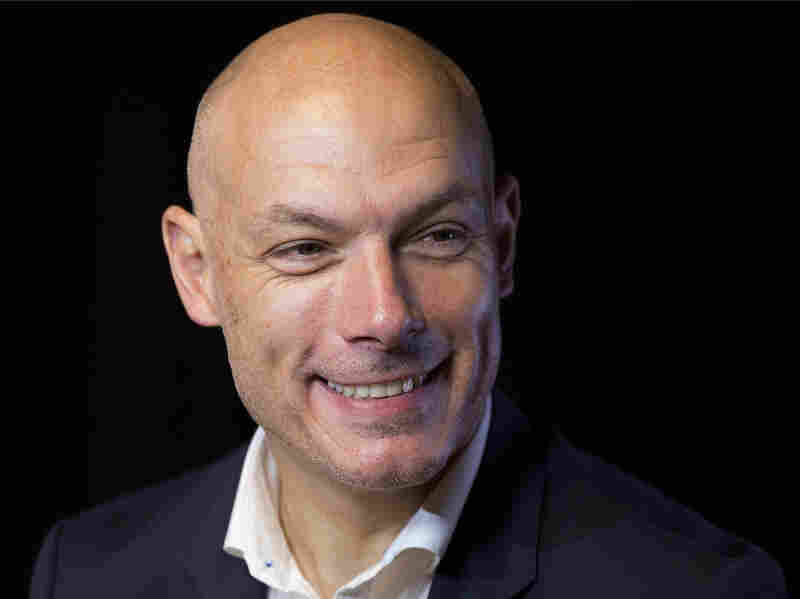 Ex-World Cup Final Referee Talks About This Critical Role Ahead Of Croatia Vs. France On the eve of the World Cup Final, NPR's Michel Martin chats with former FIFA Referee Howard Webb about what it takes to referee one of the biggest sporting events in the world. 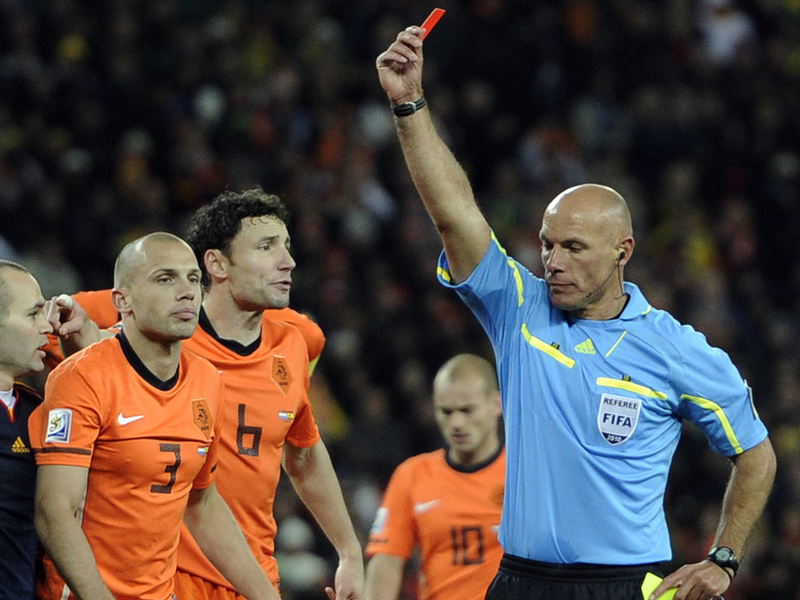 Referee Howard Webb of England, right, shows the red card to Netherlands' John Heitinga, left, during the World Cup final soccer match between the Netherlands and Spain at Soccer City in Johannesburg, South Africa, Sunday, July 11, 2010. There have been tears, tantrums, some vaudeville quality acting and plenty of surprises. But it's all coming to an end. Yes, the end of this year's World Cup is upon us. On Sunday, France and Croatia face off for the championship. We're not going to try to predict the result — that would be crazy. Instead, we thought we would take a minute to reflect on the people who will be critical to game's proceedings, and we can safely predict will be blamed, no matter who wins the title. We're talking about the referees. We were wondering what it takes to referee a World Cup final, so we reached out to English former professional football referee Howard Webb. He refereed the 2010 World Cup final between the Netherlands and Spain. That same year, he also officiated the UEFA Championships – becoming the first referee to accomplish this feat. Howard Webb, general manager of the Professional Referee Organization, talks during an interview, Wednesday, May 16, 2018, in New York. The former Premier League referee worked at the 2010 and 2014 World Cups, including 2010 World Cup final. After more than a decade as Premier League referee and officiating for FIFA from 2005 to 2014, Webb is now general manager for the Professional Referee Organization, which manages leagues in the United States and Canada. He spoke with NPR's Michel Martin about his experience on the field in one of the world's most exciting sports and his thoughts on this year's competition. It was the hardest two hours, I was sure. Yeah, it was among the most difficult games of all time and for that to happen in the final when maybe a billion people are watching kind of puts you in a difficult spot as the referee, and you know, you get to do a job you have to apply the laws of the game fearlessly and fairly. But equally, you know you don't want to overreact, you don't want to spoil the game. You don't want to react to it and create more difficulties and it's a tricky balance to strike and it ended up with me showing 14 yellow cards in the game, which is more than any other game — I refereed over 500 professional games. But yeah, that was the hardest and that number of cards would certainly reflect that. Those two points are connected quite heavily; one in terms of your police training and the other about language. ... You don't have a truncheon that you can use on the field but you learn to use really strong body language. As a police officer, you learn to stay calm. You learn to take on information for observation, you learn to be decisive make a decision based on your knowledge of the laws of the land. Or, in my case, the laws. ... of the game and you do need to speak sometimes to players. If we do speak to players from different countries, generally, English will be the default language and I used to find as well you know, sometimes the less that I said the more impactful it was. You know, if you could look at a player a certain way to tell that you weren't really impressed by what he'd just done that spoke volumes more than words. ... Being quite imposing physically, that also helped, I think in gaining — I guess the respect of the players and their cooperation. Pretty devastated. ... It is the hope that kills you, you know. We didn't expect to get to the stage we got to, to the semi-final but you know, the Croatian team they deserved it. You know, I wish both them and France well for the final. But more so, I obviously wish the referee team a smooth successful journey on what will be the biggest night of their life. I wish it was but if the referees do well, I'll be a happy man. NPR's Maquita Peters produced this story for the Web.